Did you know that Metro's unbeaten run in league play is now at 11 games, the longest in team history? Well, it is! Glory, glory, Metro! Not so much. For the fourth time on this streak, Metro blew a two-goal lead, this one in a disgusting, pathetic, ridiculous fashion, allowing DC to come back -- at Red Bull Arena, of all places -- for a 2:2 tie. The two Scum goals came in the 89th... and five minutes into injury time. Screw the unbeaten streak. This was a loss disguised as a tie. Kemar Lawrence and Sacha Kljestan's return from international duty meant a return to the bench for Sal Zizzo, and a rest for Dax McCarty, who injured himself in training. The suspensions to Mike Grella and Alex Muyl gave a rare start to Gonzalo Veron and a first one to Daniel Royer. Five minutes into the game, Ronald Zubar pulled up injured (it's been a while, hasn't it?) and was replaced by Damien Perrinelle. It was Veron who opened the scoring in the 35th. 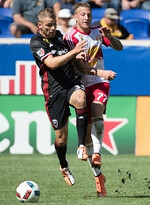 Off a turnover in front of DC's penalty area, Kljestan took the ball to the endline and crossed it in front of the net. Veron headed it in from close range. Kljestan almost doubled the lead in first half injury time, but his shot went off the post. Early in the second, ex-Metro Lloyd Sam had a chance to convert a breakaway, but Luis Robles rushed out of the net to prevent the chance. Then, in the 54th, a Sam turnover led to Royer sprinting up the field, finding Bradley Wright-Phillips. The record scorer beat Bill Hamid to the short side. You know, let's not rehash it. A loss disguised as a tie. Let's leave it at that. Lineup: Robles, Lawrence, Collin, Zubar, Duvall, Davis, Martins, Kljestan, Veron, Royer, Wright-Phillips. Subs: Perrinelle, Zizzo, Etienne.